Is Sikhi suited to the conditions of modern society? The principle of “the survival of the fittest”, is applicable as mush to religions as to communities or people. Those faiths which cannot meet the challenge of their time or the new conditions in society are likely to suffer eclipse. Sikhi however is suited to the needs of modern life. It believes in the individual and his right to develop his personality to the maximum extent possible. According to Guru Nanak, every man has power or merit; he is a part of the divine. He is not a useless weakling, a mere product of the chain-reaction of Karma. The Sikh is essentially a man of action, with an overwhelming sense of self-reliance. He should invoke the Guru’s Blessing at every step in his life and ask for His Divine Favour or Grace. Sikhi is both modern and rational. It does not foster blind faith. Guru Nanak exposed the futility of meaningless ritual and formalism. He questioned the superstitious practices of his time and he brought about a revolution in the thinking of his people. An important aspect of modern society is the belief in democracy. The welfare of man is best secured by his elected representatives. This principle is the guiding rule of the Khalsa, which entrusts all decisions to elected Five Sikhs. Sikhi also believes in the concept of a socialistic pattern society. Man’s responsibility to society lies in taking his contribution to social welfare as a sacred duty. The gulf between the more fortunate and the less fortunate has to be bridge. The Guru instituted the Temple of Bread (Langar) to break the caste system. This is a good example of true democracy in daily life. Sikhi is thus distinct from other religions and has something new to offer to man. 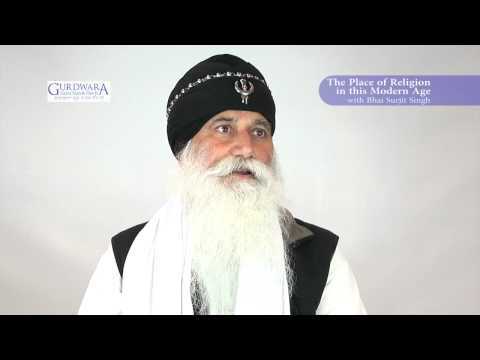 « Is Sikhi a faith of hope and optimism?